Indian Premier League season 9 is just around the corner and today we will have the Auction ahead of the 2016 season. 2 new teams Pune and Rajkot will be replacing suspended Chennai Super Kings and Rajasthan Royals in the next two seasons and it all set for another staller T20 season in India. So going into the new season we decided to take a look at IPL’s revenue/distribution model which kind of made it the most lucrative cricket league in the world. So lets just go back 9 years when IPL was formed and see how the initial model worked. On 24 January 2008 BCCI invited biddes fom IPL Franchises and they sold 8 franchises for a combined total of $723.59 million for next 10 years. Since 2008 few franchises has gone bust/suspended and a few new ones were introduced. Every franchise is required to pay 10% of the total price every year and that is the biggest revenue source for BCCI/IPL governing body. Below is the table showing how the teams were sold in 2008 and what new teams had to pay to become part of IPL. 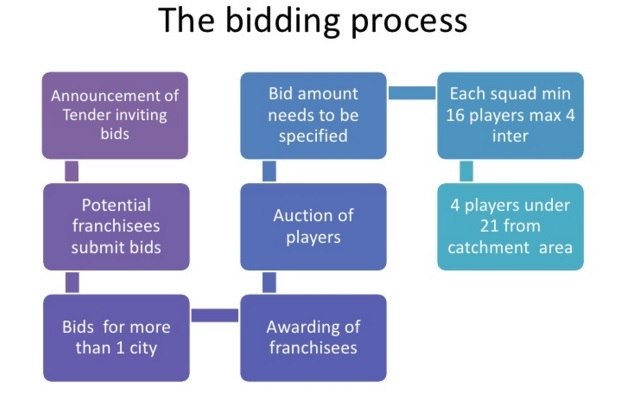 below is the initial bidding process for both Franchises and the players using in 2008. While if you scroll below you will find indepth details about IPL revenue generation and distributions channels. So how does the IPL and its frachises make money ? 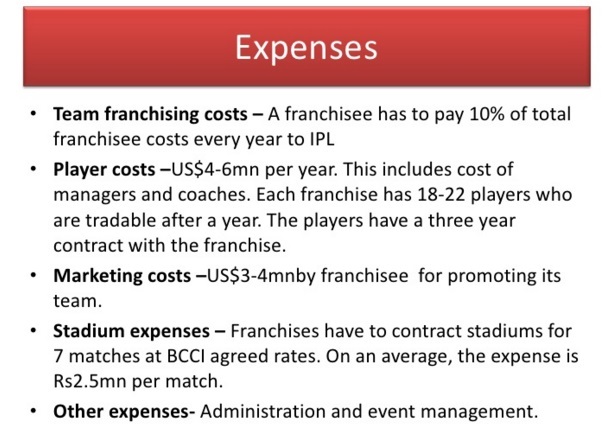 So IPL governing body (BCCI) get yearly fee from each of the franchise (10% of total franchise price every year) and that money is 100% kept by BCCI and used for orgnizing expenses etc. 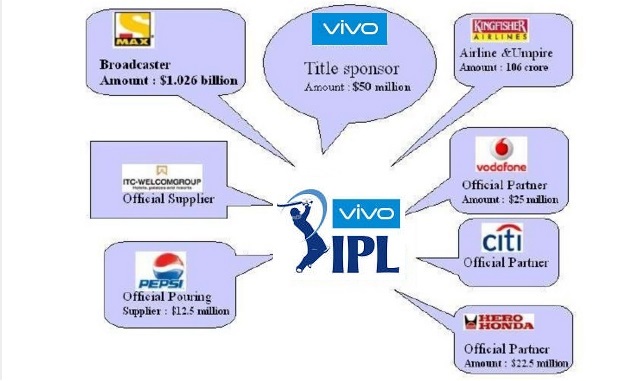 But there are other major sources from where IPL generate money like Media rights, sponsorship which is shared among franchises and IPL with 60%/$40 share. 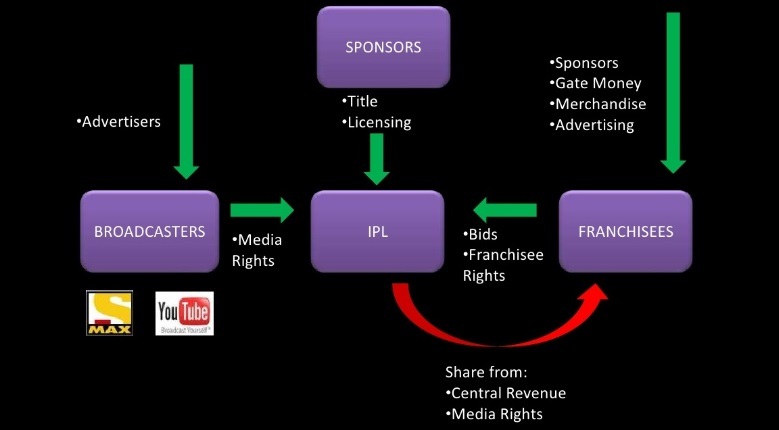 The below diagram shows the entire revenue and distribution model adopted by IPL. We explain the process in detail further down the page. #1. TV/Media Rights: Money generated from tv/media rights sale is divided into two shares. A) IPL share, B) Franchise Share. A) IPL Share: ipl will get only 20% of the media rights money in the first 2 years of IPL but set to reach 40% by 5th year onwards. 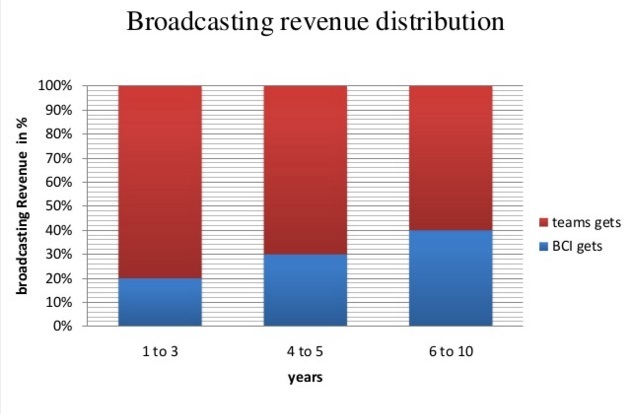 B) Franchise Share: In the first 2 years 80% of total media rights money will be divided equally among all teams but it will be reduce to 60% by 5th year onwards. So the biggest source of revenue generation in IPL is “TV media rights sale”. Back in 2008 when Sony signed a record breaking 10 year deal with BCCI for IPL rights they agreed to pay $1.02 billion over the 10 year contract. Sony will be paying 10% of the total agreed amount ($100 million) every year till 2018. So out of $100 million, $60 million is distributed equally among IPL teams every year while $40 million is kept by IPL governing body. #2. 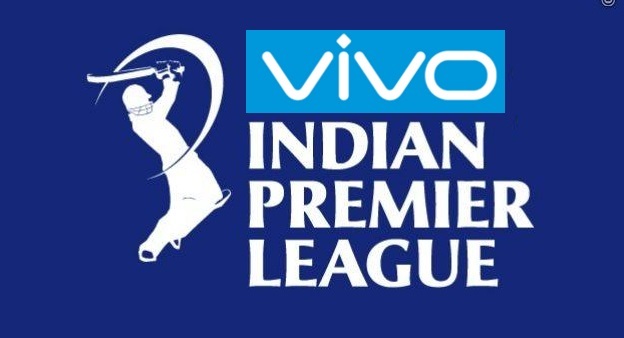 Sponsorship Rights: IPL signed official title sponsorship deal with DLF for the first five seasons than PEPSI became the title sponsors paying around 250 Crores for 5 years in a deal signed before IPL 6 season. IPL also have number secondary sponsorship deals with host of local and multinational companies as official partners. So on average around Rs. 500 crores is generated through sponsorship rights which becomes the IPL central pool and is later divided into 50/50 share between IPL and franchisee teams. Sponsorship distribution: in the first few seasons 60% was allocated for franchisee teams while IPL/BCCI got %40 percent but after the 6th season the percentage is around 50/50%. 6% from IPL’s share is allocated for prize money fund while 50% share allocated for teams is divided equally among all IPL teams every year. All franchises are free to signed their own individual sponsorship deals including kit deals/shirt sponsors or even title sponsors. While all teams control their home matches hospitality and gate/ticket revenue by 80%, rest %20 is allocated for IPL governing body. Having said that All IPL teams are finding it hard to post profit every year as they are either in loss or barely break even year after year. But the initial thought process of buying an IPL is not posting profit in short-term, most of the companies/owners bought IPL franchises as long-term investment and and open advertisement tool for their parent companies. below are some of the expensive for teams are listed.